The Spanish victory at Bailén would encourage another coalition under Frederick William III of Prussia. The Austrians would sign on, hoping to have a reason to reform their army to more modern fighting force. Unfortunately, the Austrian soldiers would fight this change and hurt the chances for Austria to do well in the war. While they were preparing for war Napoleon was attacking the Papal States over not supporting the Continental System. Pope Pius VII reacted to this invasion by excommunicating the Emperor, but this didn’t scare the French. Napoleon’s men would abduct the Pope, possibly without his approval, and keep him in prison in Savonna. After taking the territory, Napoleon would take the title of the King of Rome (1810), and also finalize his divorce to his wife. Neither of these actions would make him popular among the Catholics of France, but at this point he had too much power to care. France’s Foreign Minister Charles Maurice de Talleyrand started questioning whether Napoleon was pushing the country too far in war. Talleyrand secretly told Alexander I of Russia to stop working with Napoleon, hoping this would calm Napoleon down. While Russia chose not to do this, they did much less work with the French than they could have if they chose to. generals and some incorrect assumptions by Napoleon about the allies. When Napoleon finally showed up on the front lines, he would change the incorrect commands by his generals and solidified his soldiers. Thankfully, for France, the Austrian attacks were slow and uncoordinated, which allowed the French time to get coordinated before the battle. 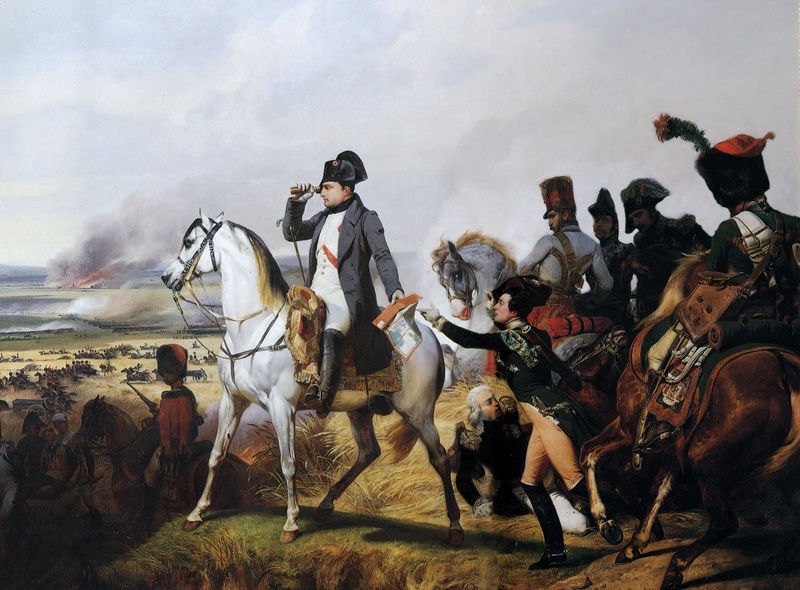 Napoleon would suffer the first major defeat of his military career at the Battle of Aspern-Essling (1809). The Austrians would attack while the French were crossing a couple of bridges, which gave the Austrians the advantage despite their uncoordinated attacks. Even though this wasn’t as decisive a battle as the Austrians had hoped, the strategy of attacking on the bridges helped the morale of the troops. The Austrians would try a similar strategy at the Battle of Wagram (1809) and attacked the French while they were crossing the Danube River. Napoleon reacted by using the artillery to scatter the Austrian troops, and they would retreat because they were worried about being surrounded. Archduke Charles (Austria) would start to fear he was going to lose this war because his army was refusing to try the new tactics that were being pushed on him. So he decided to agree to an armistice with Napoleon to discuss peace talks. The 2 sides would create the Treaty of Schönbrunn (1809), which would officially end the war and give the French a great deal of land. Metternich would talk Napoleon into a more modest deal than was the original plan because he was worried about preserving the power of the Habsburgs. The Austrians would promise friendship and complete cooperation between the countries in return. France received Carinthia, Carniola, and the Adriatic ports, which took over 3 million subjects (20% of the population) from the Austrians. Emperor Francis also agreed to pay an indemnity of about 85 million francs and would officially recognize Napoleon’s brother Joseph as the King of Spain. Napoleon also married Austrian Princess Marie Louise, hoping this would end the fighting between the 2, but this didn’t work like this completely. This may have been another victory for France, but it was obvious to everyone that there were signs of weakness in the French army. The Grande Armée was losing power compared to previous battles, mainly because the new replacements weren’t as good as earlier recruits. This issue would continue to plague the French army as time progressed.